Many people, myself included, wonder how, in 2013, a multimillion-dollar professional football team can continue to be named after a racial slur. * The success of rookie phenom quarterback Robert Griffin III – more popularly known as RG3 – and his subsequent injury in the playoffs. * Public outrage over the condition of FedEx Field during the game where RG3 got hurt. * A recent Smithsonian symposium about the use of Native American iconography and names in sports. * And the members of the US House of Representatives seeking to eliminate the team’s trademark. To fully understand the long history of the D.C. area football team’s name (note: I refuse to use the name in print), one must understand the man who bestowed that name upon the franchise – George Preston Marshall. Marshall is popularly lauded as a Football Hall of Famer for adding bands and fancy halftime shows, pushing for a standardized schedule for a season, and affecting offensive rules. But Marshall is more negatively known for his overt racism that marred his tenure as owner from 1932 until 1969. After Marshall gained sole ownership of the team, he renamed it from the Boston Braves to the racial slur it holds today. Five years after purchasing the team, he moved the franchise from Boston to Washington D.C.
As an ardent opponent of racial integration, Marshall’s teams remained all white on purpose, even as other NFL franchises began to break the color line in the 1940s. But the racialized drafting and signing of players served a larger purpose than affirming Marshall’s own personal racist beliefs. It also allowed the Washington D.C. franchise – then the southernmost NFL team – to market itself quite successfully to the segregationist American South. In 1962, Secretary of the Interior Stewart Udall and Attorney General Robert F. Kennedy successfully used their leverage against Marshall to finally break his team’s long-standing color line. They threatened to not let the team play in the taxpayer-funded D.C. Stadium if the team did not integrate. So, the 1962 NFL draft saw African American running back Ernie Davis picked by the D.C. football team. Upon getting the news, Davis remarked, “I won’t play for that sonofabitch” and was traded for Bobby Mitchell, the man who ultimately would desegregate Marshall’s squad. This is the legacy behind the name of Washington’s football team. The current owners of the Washington D.C. franchise dig in, whitewash Marshall’s racist past and extol the supposed pride and tradition of their name – as if simply doing something for a long time automatically makes it morally and ethically right. But there is a growing groundswell of resistance. Washington D.C. Mayor Vincent Gray has suggested that it is time to change the name. The recent Smithsonian symposium and a relatively slow sports news cycle has allowed this long-standing issue in sports to once again come to the fore. It has long been time to change the name and now we may have that opportunity. Photo: Old boy network? 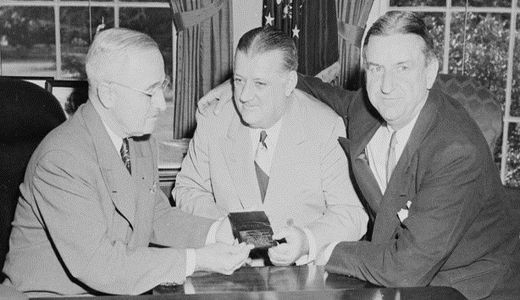 George Preston Marshall, right, owner of the Washington football team, and Bert Bell, NFL commissioner, present President Truman with his annual pass to NFL games, Sept. 15, 1949, in the Oval Office. Patent Office cancels Washington’s disparaging trademark: The U.S. Patent Office ruled June 18, 2014, that the Washington Redskins nickname is “disparaging of Native Americans” and that the team’s federal trademarks for the name must be canceled. 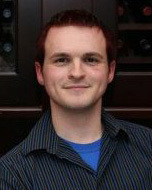 Neil Parthun is an activist and a sports fan. He attempts to bring these two worlds together with his weekly radio show/podcast/TV show "Not Another Sports Show" and with his writing. His goal is to help build a space that shows people can care about both social justice and sports.